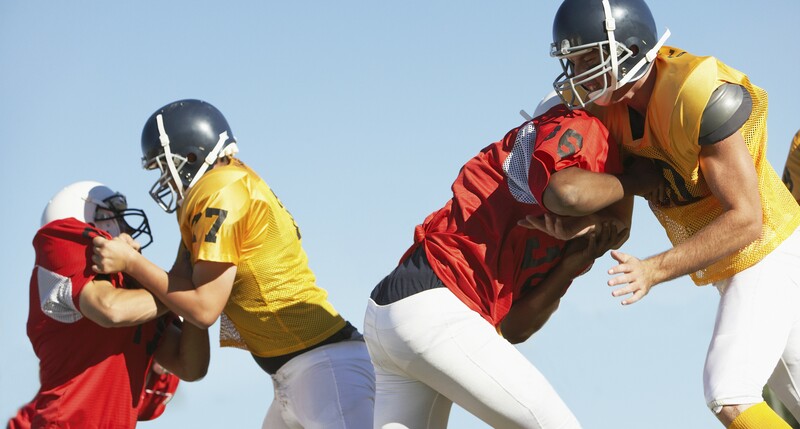 This training guide maximizes the area of muscles that are most used during football games, and there will be a specific structure to you'll follow each day. Every day will feature 4 distinct disciplines to concentrate on. Welcome to Day 2, if you missed Day 1, get it here. Rope Slams, 2 Sets @ 30 Reps – Grab a heavy rope at both ends and slam it to the ground, alternating from left side to right side. Lateral Shuffles, 2 Sets @ 15 Yard Reps – Stand in place then shuffle-run sideways for 15 yards. Each 15 yard distance is 1 rep. Pull Ups, 2 Sets @ 8 Reps – Do regular pull ups. Alternate between one underhand set and one overhand set. Agility Cone Drill, 5 minute Session – Set up 4 cones at 5 yards apart in the shape of a “T”. The base of your “T” will be your starting point. Start at the base and sprint to the middle cone, sprint to the right cone then sprint to the far left cone, weaving between the cones as you go. Sprint back to the center cone and then down to the base. Do this for 5 minutes. Bench Press, 6 Sets @ 6 Reps – This is the standard bench press. Always make sure you have a spotter before proceeding. Stab Chest Flies, 6 Sets @ 8 Reps – Rest your upper back on an exercise ball with your feet on the floor and your torso level. Do standard butterflies while balancing on the ball. Band External Rotations, 6 Sets @ 10 Reps Each Side Per Set – Attach a band to a post and stand directly in front of it. Grasp the band in your hands and twist your upper torso, stretching the band and gaining resistance. Do 10 reps to one side and 10 reps to the other side for 1 complete set. Tricep Pulldowns, 4 Sets @ 15 Reps – Using a tricep machine or looping a band on a hook above your head, grab the end with elbows bent and pull down until your arms are straight at your hips. Hold for 3 seconds and slowly return to the bent elbow position. 1 pull down equals 1 rep.
Clap Pushups, 4 Sets @ 8 Reps – Do a regular push up, but explode upwards while pushing up so that you come off the floor and clap your hands. 1 push up is 1 rep. Plate Front Raises, 4 Sets @ 8 Reps – Grab a barbell weight or use a dumbbell. Place it at your hips, arms extended. Raise it to head height and lower slowly. Each raise and lower is 1 rep. Seated Medicine Ball Throw, 4 Sets @ 8 Reps – Sit with your back to a wall with legs extended outward. Bring the medicine ball up to your chest and push/throw it as far as you can for 1 rep. If possible, get a helper to retrieve the ball so you can remain in your sitting position. Incline Dumbbell Bench Press, 4 Sets @ 12 Reps – Lay on an incline bench. Grab two dumbbells and with bent elbows, rest them at your shoulders. Press them up and bring them down slowly for one full rep. Standing Lateral Raise, 4 Sets @ 8 Reps – Grab two dumbbells, one for each hand. Stand with your feet at shoulder width and laterally raise the dumbbells until they are at shoulder height. Lower slowly for 1 rep.
Day 2 of your 4 Day Football Training regimen is complete! Subscribe below to ensure you don't miss an installment!